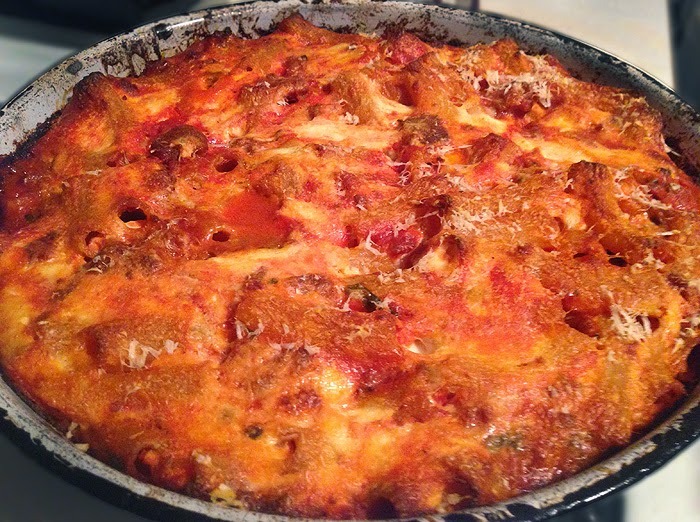 A simple baked pasta dish, like Pasta with Sausage & Ricotta, is just the thing to serve a house full of guests at Easter time. It's an effortless crowd-pleasing meal loaded with Italian sausage and dollops of ricotta cheese all smothered in a homemade sauce. This pasta dish can easily be made in advance and refrigerated overnight, making it one less thing to worry about when guests start arriving. Preheat the oven to 400°. In a large saucepan, heat 1 tablespoon of the olive oil. Add the garlic and cook over moderate heat, stirring, until lightly browned, about 1 minute. Add the sausage and cook, breaking up the meat, until browned, about 8 minutes. Add the tomato puree, water, bay leaf and fennel. Season with salt and pepper and bring to a boil. Simmer over low heat until thickened, about 30 minutes. Discard the bay leaf. Meanwhile, cook the penne in a large pot of boiling salted water until al dente. Drain the pasta and return it to the pot. Stir in the remaining 2 tablespoons of olive oil. Using a slotted spoon, add the cooked sausage to the pasta, then add 1 cup of the tomato sauce and toss to coat. Spoon the pasta into a 9-by-13-inch baking dish. Pour the remaining tomato sauce over the pasta and dollop large spoonfuls of whipped ricotta on top. Gently fold some of the ricotta into the pasta; don't overmix—you should have pockets of ricotta. Scatter the mozzarella on top and sprinkle with the Parmigiano-Reggiano. Bake the pasta for about 45 minutes, or until bubbling and golden on top. Let rest for 20 minutes before serving. It looks and sounds delicious. I'm anxious to try the recipe out. I've never whipped ricotta! I've got to try that because this pasta dish looks amazing! Sounds delicious - I'm curious to try whipped ricotta! This looks so perfect! Definitely adding it to our dinner menu rotation. I love this kind of one-dish meal. Just add a salad and bread and you're good to go. I make something similar to this. It's great for weeknight meals (with leftovers) or for feeding a crowd! This is so perfect for entertaining! I would definitely make a double batch to so I could sneak leftovers! Love that you can make this the night before! Less work during holidays is always a plus!